Over the last few years, instability of the lower back has increasingly been implicated as a cause of lower back pain. Disrupted stability of the lower back can result in an unstable spinal column and can cause chronic lower back pain. The spinal column is formed by vertebrae (bones) stacked on top of each other. 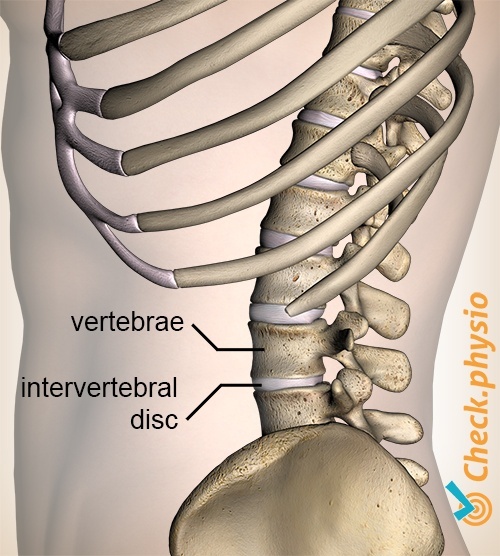 In order to ensure that the vertebrae remain neatly stacked on top of each other during movements, there are capsules, ligaments, intervertebral discs and muscles that work closely together. 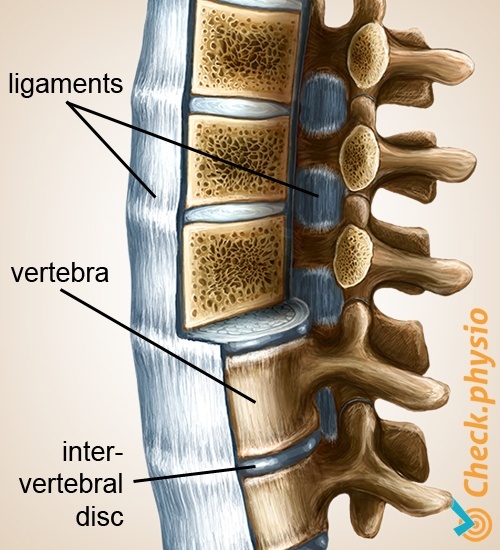 They maintain the stability of the spinal column during the various movements that the back can make. If this is not successful and the vertebae make excessive or uncontrolled movements in relation to each other, we refer to this as instability. We can distinguish two types of stability: mechanical stability and functional stability: The mechanical stability is provided by the ligaments, capsules and intervertebral discs. These are passive structures that support the fully extended movements of the vertebrae in regards to each other. The functional stability is provided by the deeper muscles, which contract at the correct moment to maintain stability of the spinal column. In particular, these are the multifidus muscle and the transverse abdominal muscle. They form a type of corset immediately around the spinal column and must be controlled very precisely. This distinguishes them from another group of muscles that are larger and located more closely to the surface. Instability of the lower back is a disruption in the mechanical and/or functional stability. As movements of the spinal column are no longer supported properly, this can result in overloading or damage to structures. This is what we experience as back pain. Various causes have been linked to instability. Often one cause will lead to another and mechanical instability and functional instability will be present simultaneously. We will mention three possible causes here. Firstly, damage to the capsules and ligaments can cause mechanical instability. This is sometimes complicated by the fact that the nerve system that tells the deeper muscles exactly how to contract is also disrupted. As a result, the deeper muscles struggle even more to correct the (mechanical) instability. Another cause can be the thinning of an intervetebral disc. This happens as we age, through prolonged overloading or as a result of - for example - a herniated disc. This creates more movement between the vertebrae, resulting in instability. A third cause appears to be the fact that the deeper back muscles sometimes no longer function properly after recovering from a period of back pain. The cause of this is unknown, but the dysfunction of the muscles (functional instability) places extra pressure on the capsules, ligaments and intervertebral discs (mechanical stability). These structures can become overloaded or damaged as a result. The signs and symptoms of back instability are not clearly described. A lot of research is still being performed. We have listed a number of symptoms below that can point to instability of the lower back. Sometimes when moving, the person will feel something shift in the back. The pain can occur with prolonged standing, sitting, lying down (e.g. having a lie-in) and prolonged walking (strolling). Start-up pain when getting up from a low seated position. Pain when leaning forward for a prolonged period. Decreased mobility of the lower back. Symptoms associated with lifting, raising or carrying. The deeper stabilising muscles of the spinal column must be trained to alleviate the instability. If these muscles contract correctly and form a good corset around the spinal column, then the instability can be (partly) resolved. The exercises are primarily aimed at controlling the muscles. This requires a lot of concentration. Training makes the muscles stronger and improves muscle stamina. Exercises are explained under the supervision of a physiotherapist, to check that the correct muscles are being tensed. At first, the contraction is a very conscious movement. After a while, the patient should start to do this automatically and subconsciously whilst performing daily activities. It may be sensible to halt the strength training of the larger and more superficial muscle groups temporarily. Beazell, J.R., Mullins, M. & Grindstaff, T.L. (2010). Lumbar instability: an evolving and challenging concept. J Man Manip Ther. 2010 Mar;18(1):9-14. El, A. van der (2007). Manuele diagnostiek. Wervelkolom. Rotterdam: Uitgeverij Manthel.